Increasing diversity within the OT profession at the Black College Expo! What a great way to start off Black History Month! Last year I attended the 2018 Black College Expo, a couple of months ago I attended the Latino College Expo, and this past weekend I was at the 2019 Black College Expo! The annual event is held at the LA Convention Center to increase Black students’ awareness and acceptance into higher education. It was an honor and joy to be able to mentor college, high school, middle school, and even elementary school students at such a life-changing and well put on event! So many incredible memories were made today, one of which I would love to share about a very bright 4th grader I met. As I saw a little girl approach the USC OT booth, I immediately became very excited! I mean, I wish someone would have told me about OT while I was in elementary school. I asked her, “Do you know what Occupational Therapy is?” And she replied, “No.” So I then asked, “What do you like to do?” And she said, “I like to play on my Ipad.” And I said “Well, if you were to get sick and not be able to play on your IPad then occupational therapists would help you play on your IPad”. She instantly grabbed an OT flyer and clipped an OT pin to her jacket. After I gave her a more in depth description of OT, she left ... and then quickly came back with her dad. By the end of the conversation we had planned for her to tour USC’s Health Science Campus to learn more about OT and the various fields of healthcare at the young age of 9! I am so grateful for events such as the Black College Expo for allowing me to have these wonderful experiences and for having USC’s Occupational Therapy and Occupational Science program in attendance. The other OTs and student ambassador present made the experience that much more special by spreading their love for OT. By attending, we were of course having a great time and helping students find their passions, while addressing AOTA’s Vision 2025 by working on one of the 5 pillars, diversity. 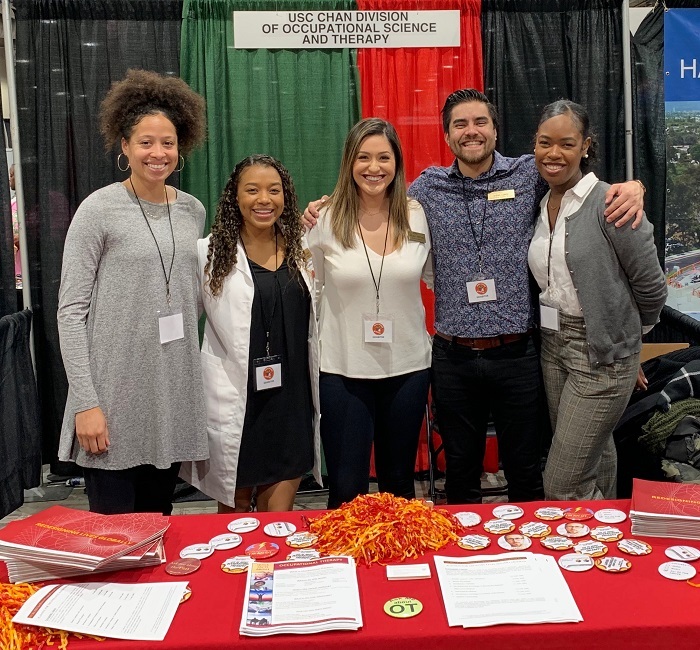 USC occupational therapists and occupational therapy student ambassadors at the Black College Expo Event at the Los Angeles Convention Center. From left to right: Natasha Strickland (OTD student), Serena Hobson (me), Melissa Martinez (student ambassador), Diego Lopez (OTD student), and Laryssa Green (OTD student).